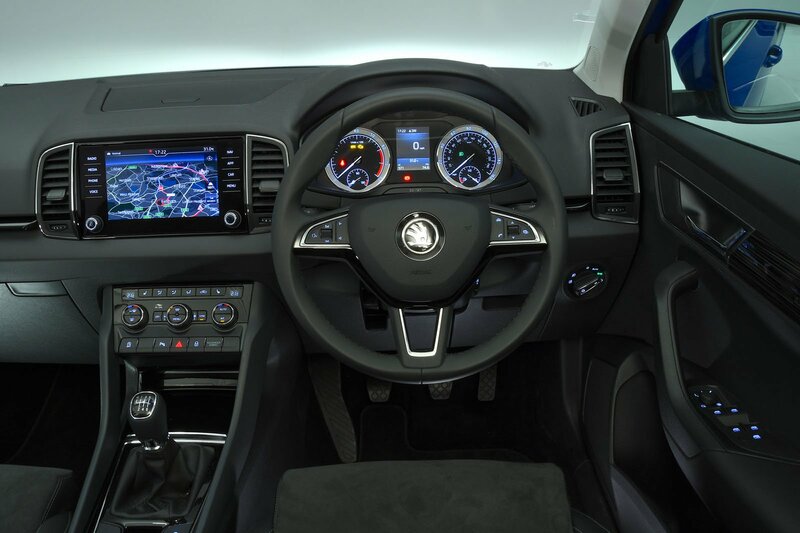 Skoda Karoq Interior, Sat Nav, Dashboard | What Car? Great news: there’s a wide range of adjustments available, so we reckon you should have no issues getting comfortable, whatever your build. 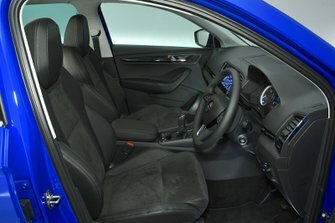 This includes seat height and lumbar adjustment on all trims, and plenty of variance to the steering wheel’s height and reach. 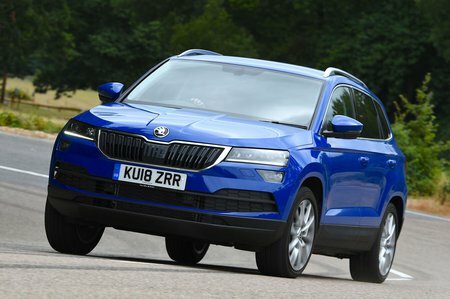 You’ll also enjoy good seat support and a relatively high driving position – although it must be said that the Karoq is no skyscraping Range Rover. Life is made easier still by well-sighted, sensibly grouped buttons and switches, as well as the ultra-clear instruments. Combining a raised driving position with thin windscreen pillars and big side windows means the Karoq can challeng its best rivals for front and side visibility. It also scores heavily over the Vauxhall Grandland X and Peugeot 3008 when it comes to over-the-shoulder vision. That’s thanks to its relatively slim rear pillars – a rare treat these days – which are a real boon when reversing. As a back-up, all models have rear parking sensors, SE Nav Plus models and above gain front sensors while SE L and above also get a rear-view camera. Even in entry-level SE trim, an 8.0in touchscreen infotainment system is fitted. And while sat-nav isn’t standard, you do get SmartLink. This includes MirrorLink that allows you to operate and view several smartphone apps – including your phone’s sat-nav – via the touchscreen, and also provides Apple CarPlay and Android Auto connectivity. The screen itself is glass-fronted, with beautifully clear graphics and simple, responsive menus. This makes it much easier to use than the ponderous system found in a Peugeot 3008. We would prefer if there were some physical shortcut buttons around the screen, though, in place of the touch sensitive ones. Move up to SE L spec and in-built sat-nav joins the package along with a wi-fi hotspot, while top-of-the-range Edition trim boosts the screen size to 9.2in and adds wireless charging and gesture control. The latter is designed to let you swipe in mid-air to scroll through things such as music playlists; in truth, it’s a gimmick that’s almost as tricky to master as alchemy, and it feels more instinctive to physically swipe the screen instead. Another feature that’s available is infotainment online. Standard from SE L grade, it’s is subscription-based and connects the car to the internet to provide live traffic, weather and news reports. There’s also an SOS button for quick access to emergency assistance; it will pinpoint your exact location for the operators, too. Meanwhile, rear-seat passengers can be kept amused with the aid of a couple of holders for tablet computers. It’s an inexpensive option that we’d recommend adding if you have young children. The standard stereo has eight speakers and offers reasonable sound quality, but music lovers can opt for an upgraded 550W Canton system with 10 speakers. Determined to ensure that the Karoq has a distinct Skoda identity, the brand’s design team has come up with an interior look that is far removed from that of the Seat Ateca and Volkswagen Tiguan. Borrowing styling cues from the Kodiaq, the Karoq’s dashboard feels more modern than those of the Tiguan and Ateca, while a few metal and piano black trims add a touch of class. You’ll find plenty of squishy plastics atop the dashboard and doors, while harder materials lower down still carry a good sheen. It is not just the finish that’s good; everything fits well, too. This lends the Karoq an air of solidity and imparts a confidence that it’ll see out the rigours of family life. We have to say, though, that as good as it is the Karoq still doesn’t have the visual wow factor of the 3008 inside.